Going into the game, we knew that Weber State's chances of securing an at-large berth in the NCAA Tournament were pretty slim. After Monday night's loss to St. Mary's, it seems those chances are probably getting closer to non-existent. It was not a "bad" loss, but Weber State doesn't have a ton of chances to impress the voters and committee in the non-conference slate, so this was a big one. In the first half, it looked like it was going to be a good night, as the Wildcats jumped out to a lead as big as 10 points, and entered the break ahead 32-31. However, midway through the second half, the wheels came off. Weber State took a 52-50 lead with 12:37 to play, but St. Mary's then went on a 28-8 run, sealing up the victory. The Gaels scored 56 points in the second half, and alarmingly struggles in the second half are becoming a trend for the Wildcats. Damian Lillard was indeed phenomenal, and led all scorers with 36 points. At one point in the second half, he scored 21 straight points for the Wildcats, showcasing his talent and the fact that not a lot of others were stepping up. He finished with 11/18 FG, 2/5 from 3PT, and 12/15 from the FT line. He was the best player on the floor. Kyle Tresnak was a key going into the game, and he did step up, finishing with 17 points on the game. He was a force in the first half when Weber State went on a run to take the lead, and the only blemish of the day was at the foul line (3/10). 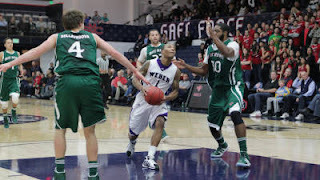 Beyond those two guys, Weber State simply did not get production. Kyle Bullinger was battling an injury, and finished scoreless in 32 minutes. Scott Bamforth was hounded all game long, and had 5 points on just 3 shot attempts. Frank Otis contributed 8 points in 24 minutes. Nobody else scored more than 4. To go on the road and beat a team like St. Mary's, who will be a player in the WCC, you need balance and a lot of guys to step up, but unfortunately they didn't have that in this one. Weber State will be off until Saturday, when San Jose State comes to town. The loss drops Weber State to 4-1.